Which look is best if you want to promote cycling? Comment & Analysis: Quoted as an obesity expert, Dr Donal O’Shea, the director of weight management services at two hospitals in Dublin, told the Irish Independent yesterday that driving children short distances to school is damaging. It’s worth reading the article in full, here. He pointed out that 2,500 secondary school girls in Ireland drive themselves to school but only around 500 cycle (likely stats from the 2006 census). 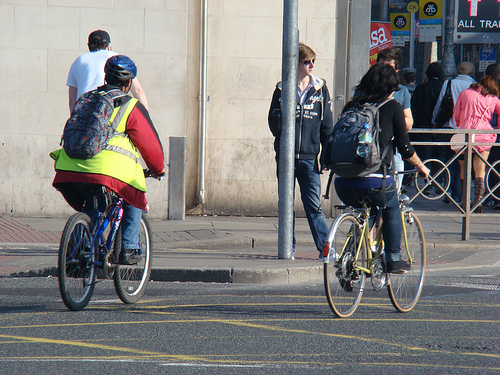 Because of overly obsessed safety agencies and others, cycling promotion for children and adults in Dublin and the rest of Ireland is sadly hugely hindered by the high-vis and helmet agendas. Getting people cycling can be hard enough with out unneeded and unproven safety gear getting in the way. So to hell with safety? No. Convince people to use good lights, which are far more effictive than high-vis ever will be, and helmets are all they are made out to be, see this article on IrishHealth.com and the comprehensive resource cyclehelmets.org. You might get primary school children to wear high-vis and helmets, you might even get some secondary school teenagers wearing them. But make if you want to make cycling any way mainstream while promoting “safety” gear, including for girls, forget it. So how do you make cycling safer? The most effective and most proven way to make cycling and walking safer is to get more people cycling and walking (sources: 1, 2, 3 etc), second to that is to lower speeds of cars (1 etc). As already mentioned getting cyclists to use lights is more important and beyond that cycling training could be rolled out as promised in the National Cycle Framework Policy. Generally and quickly implementing the policy would make a huge difference.